Two young girls show off their newly-created books, based around the theme of “X Makes a Difference to Me.” Emily (on left) has described her love of gymnastics, and Bailey (in center) has written about being an animal lover. Altrusan Debra Grover (on right), who has just bound the books, headed the Washington C.H. Altrusa Club’s service project along with co-chairs Elaine Crutcher and Anne Quinn. Other members of the club supplied refreshments, stuffed treat bags and acted as “editors” during the Saturday afternoon workshop. For 25 years now, the fourth Saturday in October has featured one of the largest annual single-days of service nationwide, named “Make A Difference Day.” Because Altrusa International, Inc., focuses on community service, local Altrusans have long participated on this day in projects that benefit Fayette County; and because the international organization’s emphasis is on literacy, for the past three years the Washington C.H. club has collaborated with Carnegie Public Library on a young authors’ workshop. 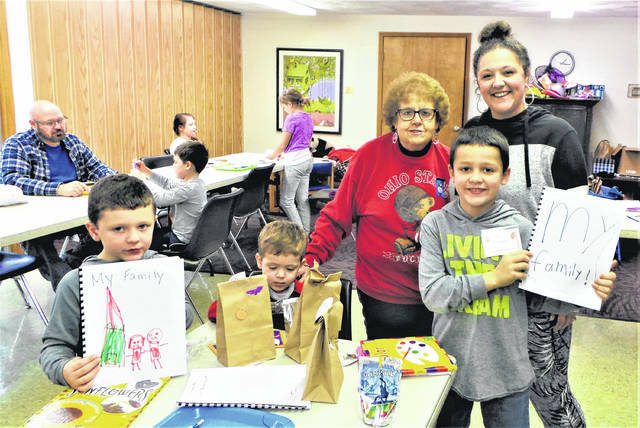 Four members of the Everhart family—(l-r) Greyson, Carson, Jackson, and mom Tara Everhart—are congratulated by Altrusan Teresa Combs (back row left) after the two older boys, pupils at Cherry Hill Primary School, had completed their books. Visible on the table are the two gift books selected by Greyson and Jackson. Also visible In the background are Washington C.H. City Schools Superintendent Tom Bailey and his children. 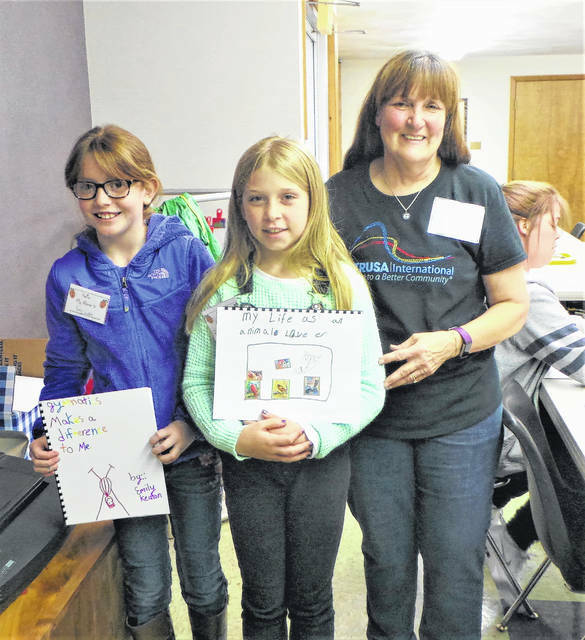 https://www.recordherald.com/wp-content/uploads/sites/27/2017/10/web1_20171028_125802.jpgTwo young girls show off their newly-created books, based around the theme of “X Makes a Difference to Me.” Emily (on left) has described her love of gymnastics, and Bailey (in center) has written about being an animal lover. Altrusan Debra Grover (on right), who has just bound the books, headed the Washington C.H. Altrusa Club’s service project along with co-chairs Elaine Crutcher and Anne Quinn. Other members of the club supplied refreshments, stuffed treat bags and acted as “editors” during the Saturday afternoon workshop. https://www.recordherald.com/wp-content/uploads/sites/27/2017/10/web1_20171028_131747.jpgFor 25 years now, the fourth Saturday in October has featured one of the largest annual single-days of service nationwide, named “Make A Difference Day.” Because Altrusa International, Inc., focuses on community service, local Altrusans have long participated on this day in projects that benefit Fayette County; and because the international organization’s emphasis is on literacy, for the past three years the Washington C.H. club has collaborated with Carnegie Public Library on a young authors’ workshop. Four members of the Everhart family—(l-r) Greyson, Carson, Jackson, and mom Tara Everhart—are congratulated by Altrusan Teresa Combs (back row left) after the two older boys, pupils at Cherry Hill Primary School, had completed their books. Visible on the table are the two gift books selected by Greyson and Jackson. Also visible In the background are Washington C.H. City Schools Superintendent Tom Bailey and his children.